Turns out there are at least two things Tommy and Angela have in common — first up, they’re both in mourning. The two archenemies on Power are reeling from losing the loves of their lives — Tommy lost Holly a couple of episodes back because, well, he killed her. Angela lost Ghost because he finally (some might say smartly) broke up with her — and they’re both hurting something fierce. The other thing they share? They’re both in trouble at work. Angela (Lela Loren) has to start answering some tough questions at her office. Once again it looks like she’s bent the law to aid her seedy ex-lover Ghost (Omari Hardwick) in committing a crime, and things don’t look good for her. Tommy isn’t exactly happy with this new life, but what can he do? 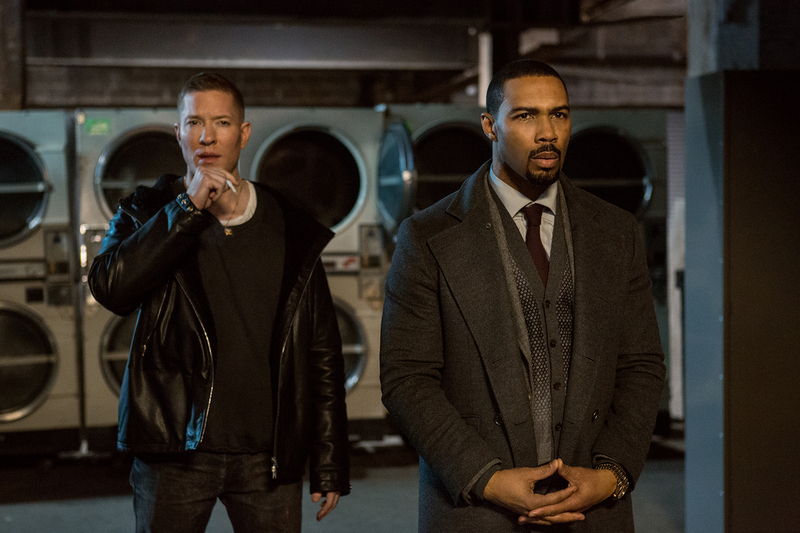 Tommy (Joseph Sikora) and Ghost are reunited, but they’re both forced back into the drug gang by Milan (Callan Mulvey), the Serbian bad guy who has been leaving all those scary cards. It was quite the plot twist in last week’s episode and the internet rightfully went nuts over the delicious reveal. It was he who was sending the bloody La Araña cards — a calling card for death. And now he’s bossing the two former drug lords back into business. Or else. Tommy isn’t exactly happy with this new life, but what can he do? He’s still pining for Holly (Lucy Waters) and is now wearing the ring he gave her around his neck and its presence is a painful reminder. He’s torturing himself. Ghost is all jacked up because Milan wants him to start selling drugs in his clubs. Milan also pulls a pop-up at the crib and brings food for Ghost, Tasha and the kids and a woman whom Ghost had Dre go to the authorities over because he surely thought she was dead and Milan was at fault. He then learns from Tasha that Angela also pulled a pop-up at the crib earlier that day and knows that Ghost had something to do with Lobos’ death. And then Ghost clues his wife in on the mess that he’s into and reveals Dean’s true identity (he’s crazy Milan, not his private security guard). As for Tommy, if his emotional pain isn’t enough — and my God, it looks bad — he gets beaten to within an inch of his life by — surprise! — Milan’s goons. But because he stands there and takes a brutal beating, Milan stops the attacks. Perhaps he can be useful. Oh, boy. Maybe the boys won’t be back together for as long as we thought. Sounds like another breakup is coming soon.